May 18, 2015 May 18, 2015 • Glenna G.
Woo! Seattle! Finally, a trip to the Pacific Northwest. I met up with my friend Becca, who I haven’t seen in quite a while. She’s been doing a traveling grad school program for marine bio, and it was great to catch up on all of her adventures, while exploring a city that was new to both of us. After meeting up at the airport, we headed to our Air B&B. Although we didn’t actually see our hosts till Sunday, we felt right at home in their cute loft. 5 flights of stairs up, we had a little room and balcony that overlooked the city. We dropped off our bags, and then headed out! 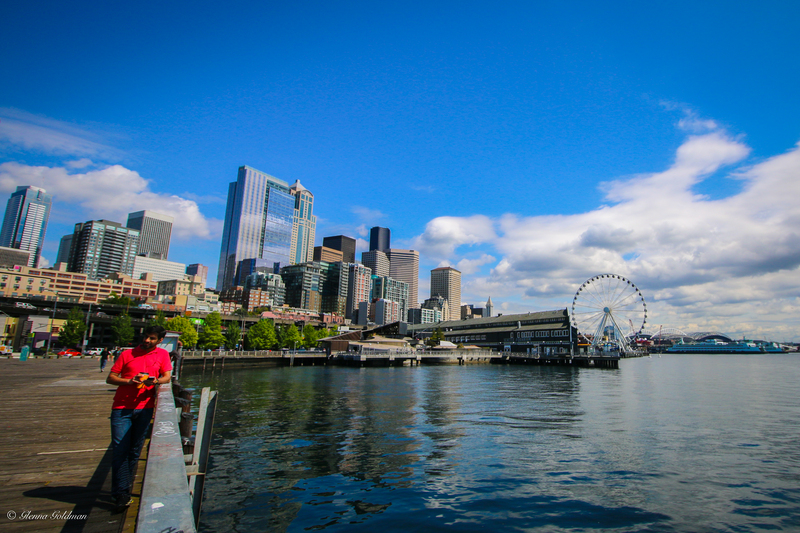 Despite Seattle’s rumored rainy days, it was bright and sunny. We met up with some of Becca’s school friends for brunch, and then walked around downtown. It was so nice to be in a place that was green and cool, full of grass and blooming flowers. There were parks and gardens everywhere! We explored the waterfront a bit, checked out the aquarium, and then visited Pike’s Place Market. 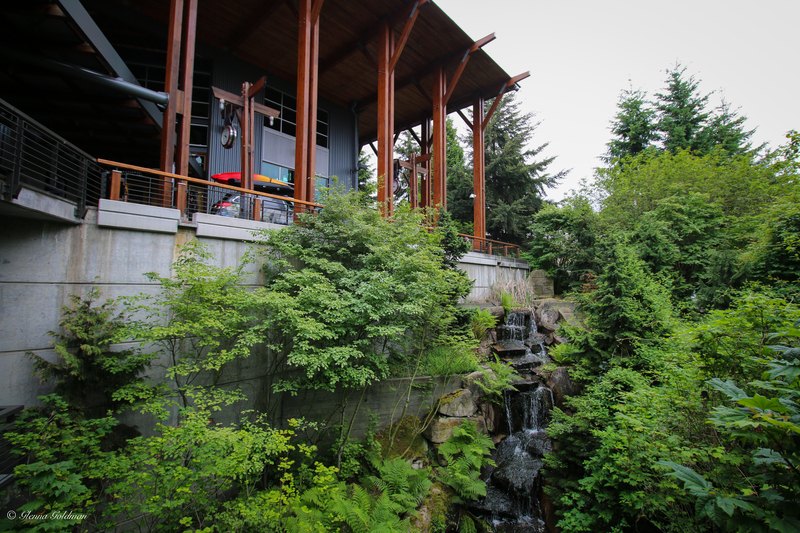 The next morning we visited the REI flagship store. It had a waterfall, hiking trails, and a climbing wall. SO COOL. Becca got a raincoat, very appropriate. Next was Pioneer Square and the Underground Tour. Our guide was hilarious, and gave us a very entertaining history of the city. If you like to read about corruption and scandal, read about Seattle’s beginnings, and the Gold Rush. A history of the Underground City: After a large fire destroyed 25 blocks of downtown Seattle in 1889, it was decided that buildings could no longer be built from wood. Instead of leveling the old city or burying it completely, city leaders came up with a different plan. The city built high walls on either side of the old streets, filled them with dirt, and paved them to raise the streets one level above the old buildings and sidewalks. So, people had to climb down a ladder to the businesses on either side of the street. Eventually the business owners built up to the new street level, leaving hollow tunnels as high as 35 feet underneath a new level of sidewalk. In 1954, a man named Bill Speidel brought attention to the underground city. After noting that the historic birthplace of Seattle had fallen into disrepair and old hotels were being demolished to make way for parking garages, he wrote a letter to the newspaper about the tunnels. Apparently the tunnels were a rumor that locals knew about, but no one was really sure where they were located, or how far they extended. After an overwhelming public response to the letter, Speidel and his wife began to conduct tours of the underground city. 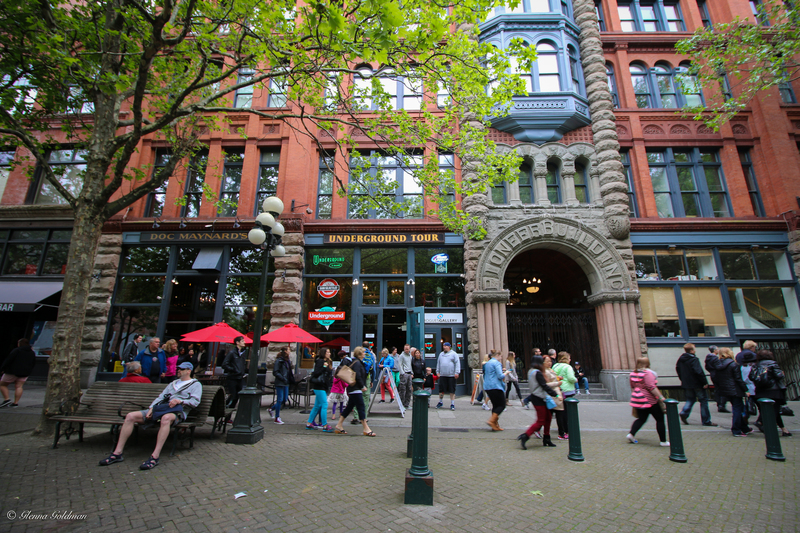 After gaining the designation of a Historic District under the National Historic Preservation Act, Pioneer Square was revitalized and is to this day a very cool little historic neighborhood. Here you can see an original skylight, created to provide light for those traveling through the tunnels. A few of the original building storefronts can be seen while walking along the tunnels. We walked past a bank, saloon, and a few other buildings. The company also does a paranormal tour, which I think would be quite exciting! Maybe next time. 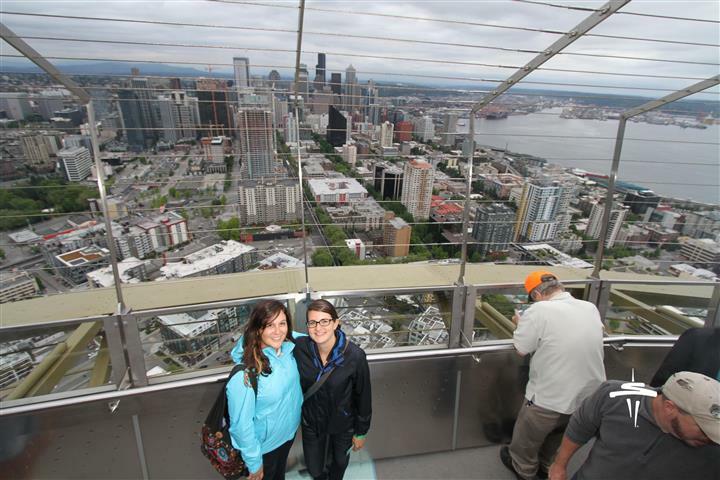 Although it was cloudy, we headed to the Space Needle! They had a nifty camera where you could scan your ticket, and it did a little countdown for you before snapping your photo. Bit of a different angle, to fit in more of the view. There was also an interactive map, where you could get a 3-D tour of highlights of the city (like Bill Gate’s house), or you could add where you were visiting from. We met some people from Australia, and there were many foreign languages being spoken at the top of the Needle. Then we headed to what was perhaps my favorite part of our trip, the Chihuly Exhibit! I was first introduced to Chihuly in Richmond, as the art museum there has a few of his sculptures. The Desert Botanical Garden in Phoenix also has one of his sculptures. I love how his art is inspired by nature, and surrounded by nature in the outdoor exhibit. There were also some short documentary films about his work in the exhibit, which of course caught my attention. After enjoying the exhibit, Becca and I headed back to Fremont for a night out on the town. Next time we’ll visit Capitol Hill, which is reputed to have some very unique bars and breweries. On Sunday we met up with an old friend of Becca’s, and she was kind enough to take us to see the Fremont Troll and Gasworks Park. We also visited the University of Washington’s street fair, and then it was time for me to fly back to Phoenix. It was a great long weekend exploring a new city, and I’m happy to say that people in Seattle are some of the friendliest I’ve encountered while traveling. It was also very easy to get around without a car, once we figured out the bus system. Next time I’m in the area I’ll be doing more nature-related things, and hopefully I’ll get to visit Becca during her internship in California! Till next time, Pacific Northwest! So fun to see a tourist’s experience in my hometown. 🙂 Glad you had fun!